Happy Thanksgiving to all of our clients and friends. 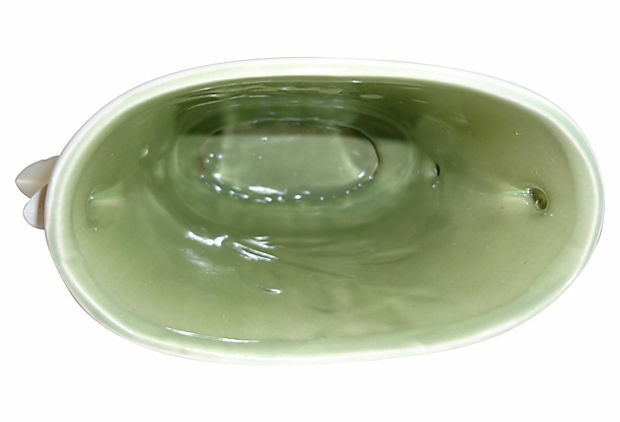 It has been a few months since we have updated this site but just in time for the holiday season, we have selected a number of beautiful vases, candle holders and ceramic works from all of your favorite Pottery Companies including Roseville, Weller, Red Wing, Monmouth and Stangl. All of these items are now available through BillyBlueEye on E-bay.com. For your convenience you may use this link to our “Items for Sale” page. We are offering these items in the E-bay highest bidder format and with a “Buy it Now” price if no bids have been received. 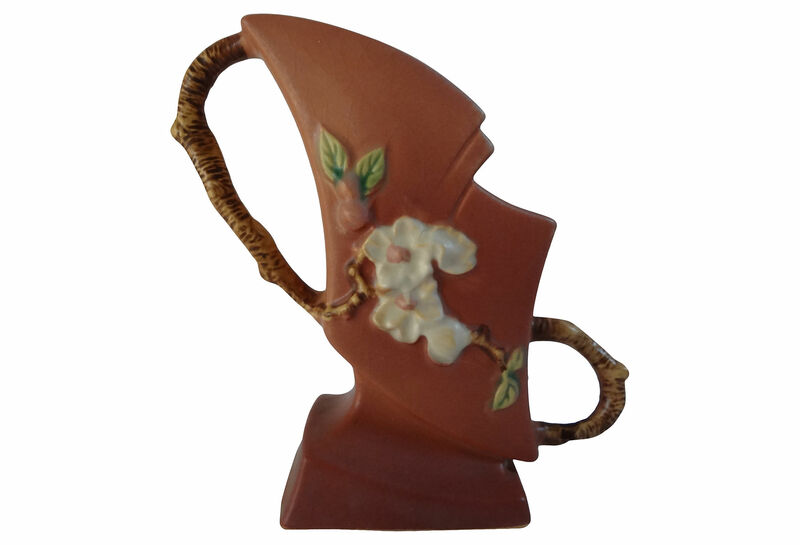 Roseville Pottery, c. 1948, “Apple Blossom”, Double Handled 7″ Vase in Terra Cotta, Offered at an Opening Bid of $64.99 on E-bay. Includes Free Shipping. BillyBlueEye takes pride in our expert packing for shipment that includes double boxes and insured delivery. We sincerely hope that you take a look at our current listings on E-Bay and check back frequently for additional items. We will also be featuring new items on this website as well as offering BillyBlueEye.com specials that are only available through this site. We hope you enjoyed your Thanksgiving and as we move into the December holiday season that you keep us in mind for all of your gift-giving needs. Billy Blue Eye Pottery and Paintings is pleased to announce our participation in the Jamestown Village Vintage Flea Market in Tustin, California this Sunday, April 27th. The event is held on the fourth Sunday of every month in the Jamestown Village parking lot in Old Towne Tustin located at 474 El Camino Real, Tustin, CA, 92780 from 8AM until 3PM. The event is a favorite among Orange County collectors and was recently awarded 4.5 stars out of 5 by the readers of the online site Yelp.com. We will be located in space #4 near the entrance into the parking lot from El Camino Real. Look for our green and white tent. We hope to see you there! Billy Blue Eye Pottery and Paintings is pleased to announce our return to the Jamestown Village Vintage Flea Market in Tustin, California this Sunday, January 26th. The event is held on the fourth Sunday of every month in the Jamestown Village parking lot in Old Towne Tustin located at 474 El Camino Real, Tustin, CA, 92780 from 8AM until 3PM. The event is a favorite among Orange County collectors and was recently awarded 4.5 stars out of 5 by the readers of the online site Yelp.com. 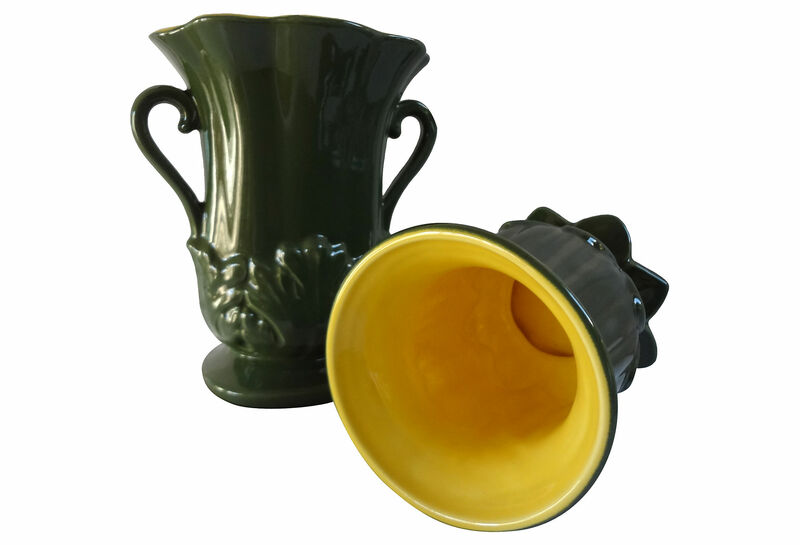 Billy Blue Eye Pottery offers quality vintage and antique ceramic items from all of your favorite American, Canadian and English pottery companies. After a year-long absence from the Tustin event, we are thrilled to be returning to work this fun event. Look for our familiar green and white tent and be sure to stop by. We promise to tempt you with our great inventory. See you there! Begin a Happy 2014 with a Pair of Rum Rill Ewers – Free Shipping! In 2013 we saw a renewed interest in one of the lesser known but widely collected and prized American pottery companies. Red Wing Pottery (1878-1967) made Red Wing, Minnesota, a city better known for shoes, its home and began an art pottery line in 1929. Under the direction of George Rumrill, Red Wing produced a series of Rumrill releases from 1932 until 1937. 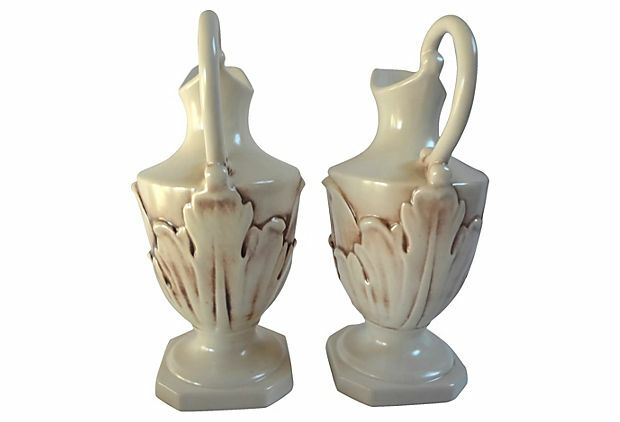 This beautiful pair of classic Roman pitchers are footed and embossed with acanthus leaves, a favorite decoration used by Rum Rill and others in the 1930s and ’40s. 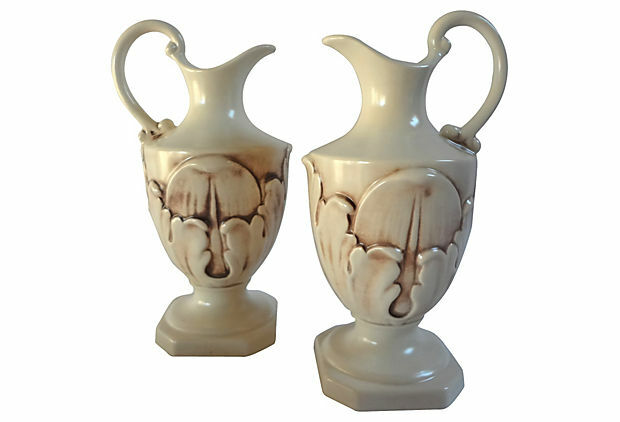 The pair is finished in the Pompeian glaze an ivory-colored base that has been wiped with a brown over-glaze that helps to highlight the pattern. Both of the ewers are faintly bottom marked “Red Wing 448” and are in exceptional condition. 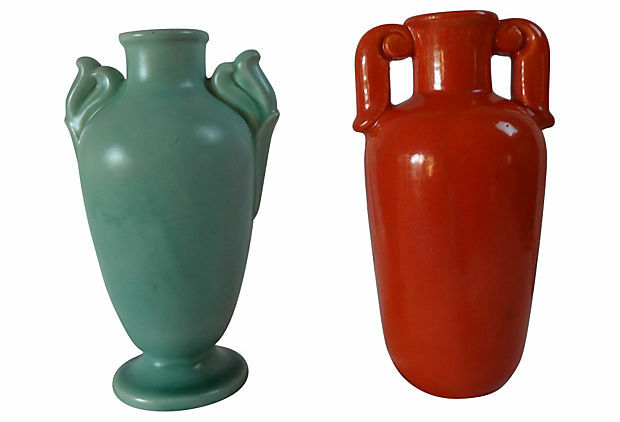 We guarantee that these terrific ceramic works will be shipped within 48 hours of receiving payment and will arrive well packaged, double boxed and insured against loss and damage. California residents are subject to local sales tax. We accept Visa, MasterCard and Pay Pal all processed in a safe and professional manner. To order call our Direct “Holiday Special” Phone # 949-496-1889 between the hours of 7:00 AM and 9:00 PM Pacific Standard Time. If you have any questions or to order online you may e-mail us direct at BillyBlueEye@cox.net. 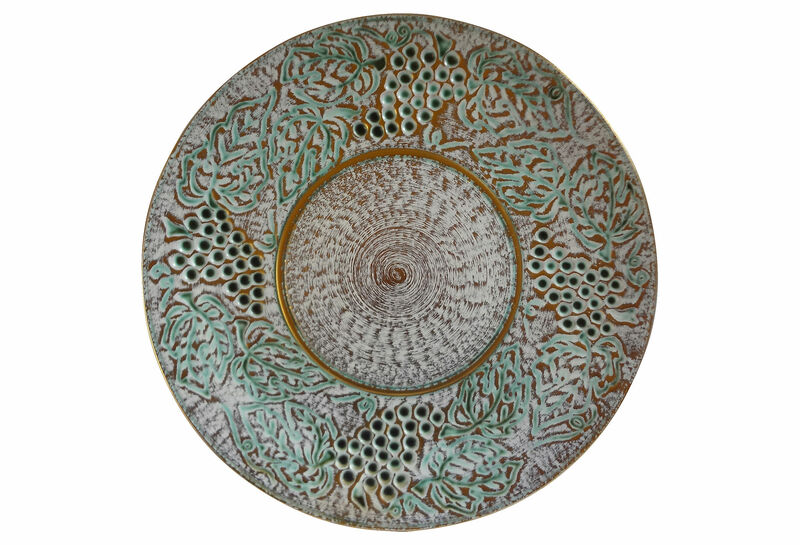 Be sure to visit us often for more terrific works from all of your favorite pottery companies. May you enjoy a happy, healthy 2014 filled with the love of friends and family. We appreciate your business and interest! Please Note: The Special Holiday Pricing has expired. Please contact us directly if interested in this terrific pair of ewers. We will be happy to offer free shipping. Merry Christmas to all of our Billy Blue Eye clients, fans and visitors. 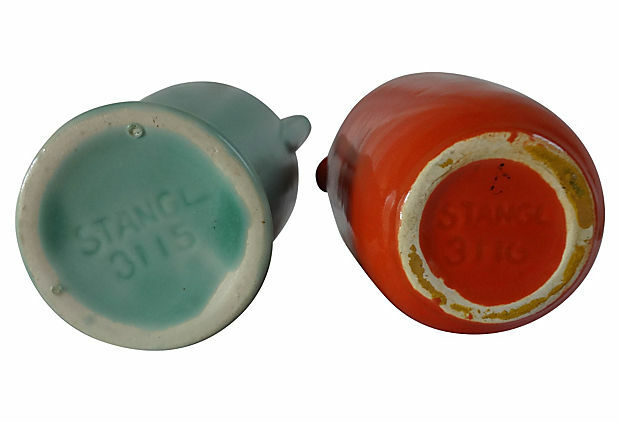 Today we have a very special offering from Stangl Pottery. Increasingly rare, these popular Stangl Pottery (Trenton, NJ) gift items from the late 1930’s were modeled after classic Greek pottery forms. 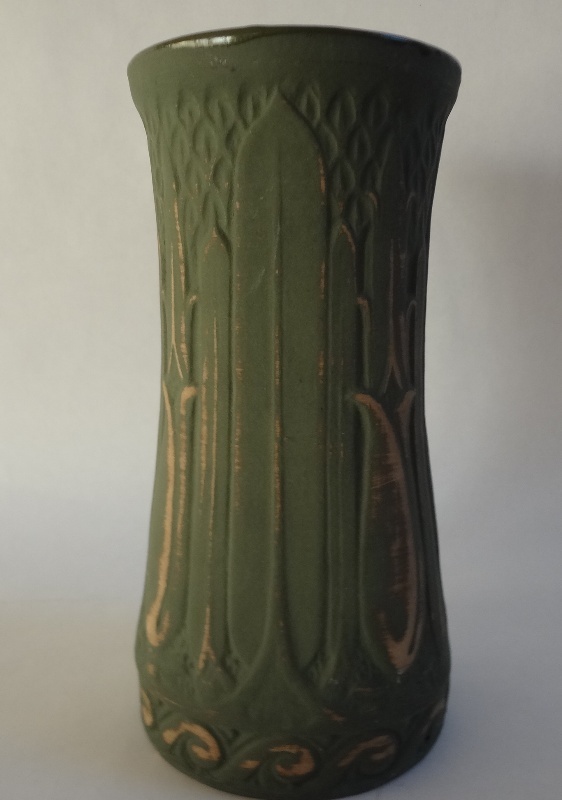 Offered is a 5.5″ Footed Bud Vase with Winged Handles and a soft-to-the-touch satin green finish which was produced in 1937-’39. The bottom is incised “Stangl 3115.” The second is a 5.75″ Amphora vase with Scroll Handles finished in a tangerine glaze. This tangerine color tone was produced for only six months in 1937. The bottom is incised “Stangl 3116.” Both vases are in excellent condition. These individual bud vases carry book values of $75.00 to $125.00 each. All of our remaining daily specials will be available through Christmas Day. We guarantee that the item will be in very good to superior condition and we offer a full refund if you are not 100% satisfied with your purchase. We guarantee that your selection will arrive well packaged and double boxed at a discounted shipping price of $15.00 in California and $20.00 for the rest of the USA. California residents are subject to local sales tax. We accept Visa, MasterCard and Pay Pal and guarantee that your insured item will be shipped within 48 hours of receiving payment. To order call our Direct “Daily Special” Phone # 949-496-1889 between the hours of 7:00 AM and 9:00 PM Pacific Standard Time. If you have any questions or to order online you may e-mail us direct at BillyBlueEye@cox.net. Be sure to check back tomorrow for another terrific work from one or more of your favorite pottery companies. Please note: Special Holiday Pricing has expired. If interested please contact us. 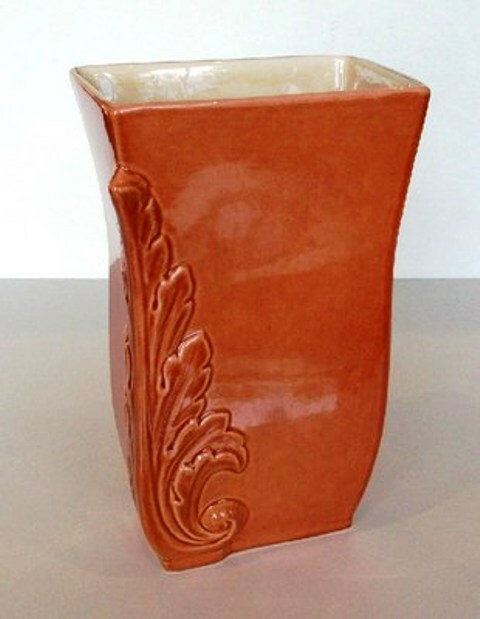 Red Wing Pottery, c.1940’s, 7″ Footed Double Handled Vase with Embossed Tulips, Mold #861, List Price $79.00, SOLD! 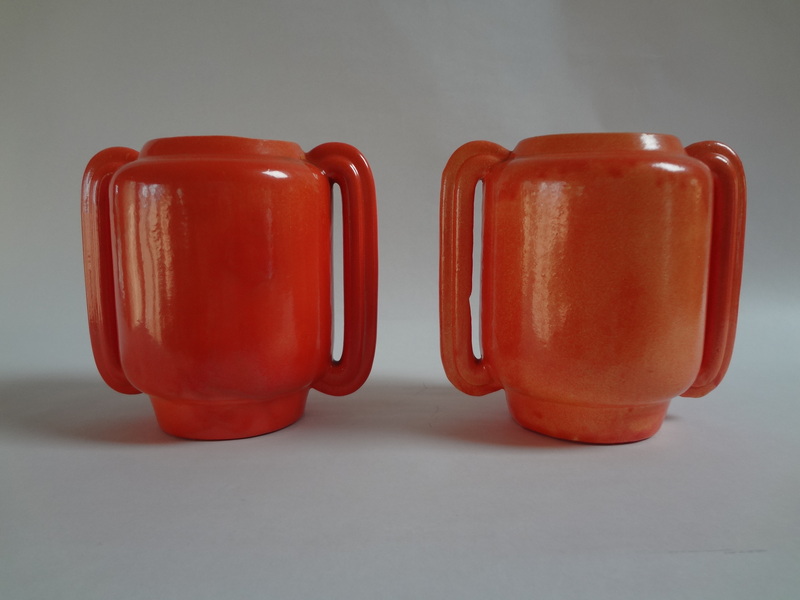 Red Wing Pottery (1878-1967) of Red Wing, Minnesota began art pottery production in the 1920s. Red Wing’s designers created items that were always evolving with the fashion of the day. 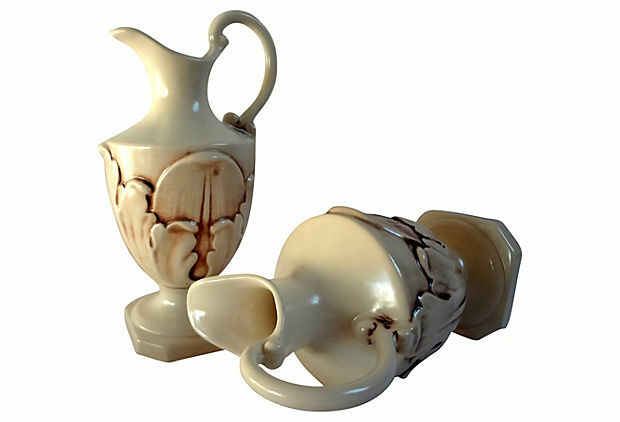 This 1940s footed vase has unusual handles as one is longer than the other. 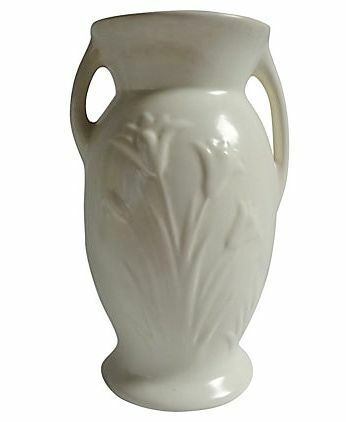 Both sides of the vase have been embossed with a bouquet of tulips. The interior of the vase has some minor hard water stains but overall this vase is in very good condition. The 7″ vase has been bottom incised “Red Wing 861.” We are offering it until December 25th at a Super Special Price of $59.00 a 25% savings from the Book Value. 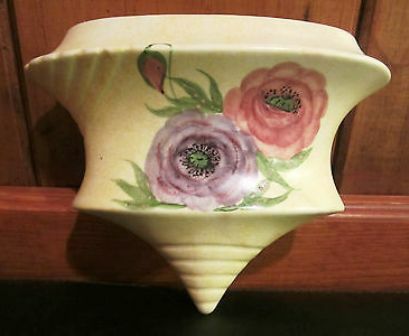 Red Wing Pottery, c.1940’s, 7″ Footed Double Handled Vase with Embossed Tulips, Mold # 861 SOLD! 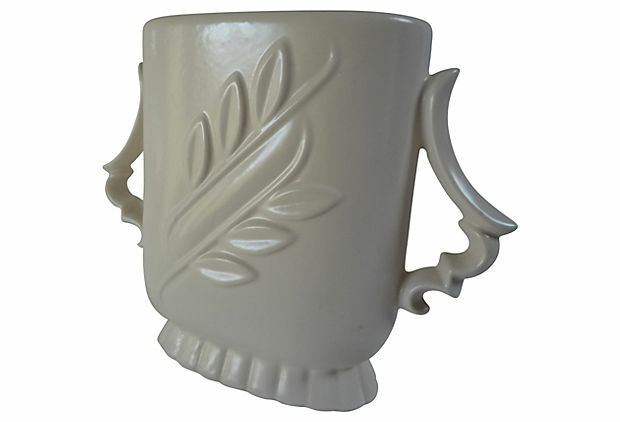 Our second “white as snow” vase also comes from Red Wing Pottery and it also has unusual handles. 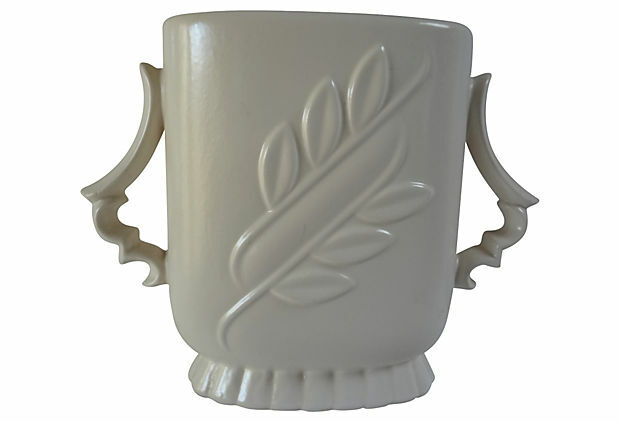 This 7″ footed vase has been embossed with two branches and leaves. 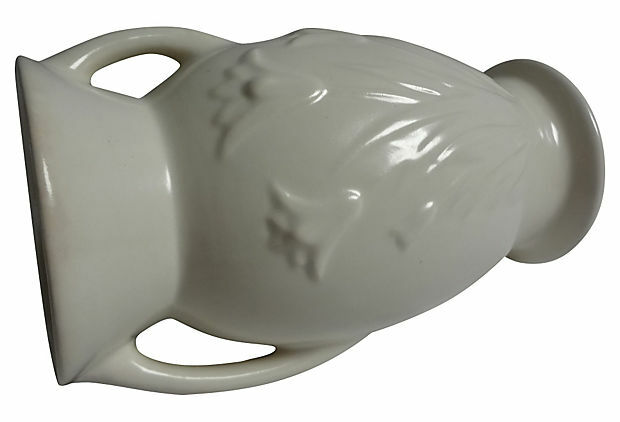 Ceramic designers became obsessed with handle design in the late 1930s and early 1940s and this vase has a pair of very unusual handles. The bottom has been incised “1174 Red Wing USA.” and the vase is in superb condition. All of our remaining daily specials will be available until Christmas Day. We guarantee that the item will be in very good to superior condition and we offer a full refund if you are not 100% satisfied with your purchase. We guarantee that your selection will arrive well packaged and double boxed at a discounted shipping price of $15.00 in California and $20.00 for the rest of the USA. California residents are subject to local sales tax. We accept Visa, MasterCard and Pay Pal and guarantee that your insured item will be shipped within 48 hours of receiving payment. To order call our Direct “Daily Special” Phone # 949-496-1889 between the hours of 7:00 AM and 9:00 PM Pacific Standard Time. If you have any questions or to order online you may e-mail us direct at BillyBlueEye@cox.net. Please Note: The Special Holiday Pricing has expired. 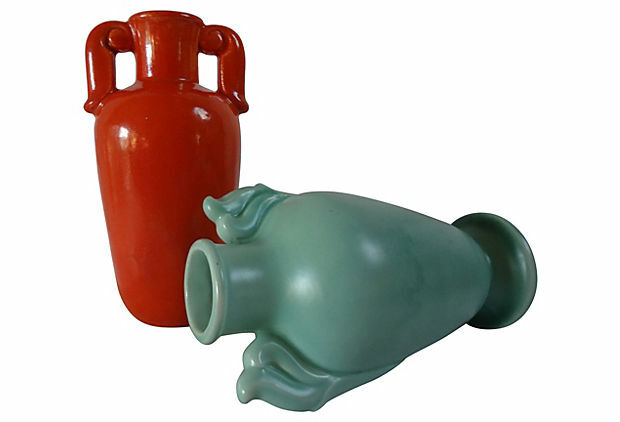 Please contact us directly if interested in one of these vases. Royal Haeger, c.1940’s, 8″ Ballerina in Tutu with Art Deco Disc Vase – unmarked but in Reference Books, List Price $119.00, Super Special Price $ 75.00 SOLD! The perfect gift for your little Ballerina or for one that appreciates the Art of Dance from the Royal Haeger Pottery Company. David Haeger opened a brick company providing building materials to reconstruct Chicago after the fire of 1871. As time progressed and an appreciation for his fine craftsmanship grew he expanded his business into the art of ceramics. Noteworthy designers have worked for Haeger, including Royal Hickman (1938). One of Haeger’s art pottery divisions, Royal Haeger, carries his first name. Royal was known for his ability to capture the spirit of the Art Deco movement into his designs. This 1940s figural work is most likely a Royal Hickman design although I have been unable to find credit given to him or any other designer. It features a ballerina dressed in a tutu next to a disc-shaped vase. The vase not only draws from Art Deco design but a strong Edgar Degas influence should be noted as well. Although unmarked, it is well documented in Haeger reference books. 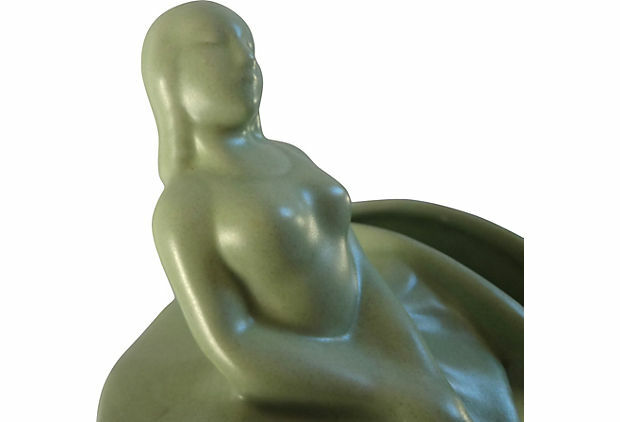 This example, offered in a soft sage green stands about 8″ tall and is in superb condition. Royal Haeger Pottery, c. 1940’s, 8″ Ballerina Vase with Art Deco Disc, Side and Back View, SOLD! Royal Haeger Pottery, c. 1940’s, Ballerina Vase with Art Deco Disc, Close-Up of Face Detail, SOLD!